HOUSTON (KTRK) -- Detectives with the Harris County Sheriff's Office needs your help to find a man wanted for kidnapping two women at gunpoint and forcing them to drive to ATMs in northwest Harris County. The first robbery happened on December 14, 2015, at around 8pm in the parking lot of the Target Store at 6955 North Highway 6. A 43-year-old woman was getting into her vehicle when a man forced her into the passenger side. He showed a gun and ordered her to drive to an ATM, where she withdrew $500. The victim was then ordered to drive back to the Target store, where the suspect got out and fled. The second robbery happened on December 15 at 22529 Tomball Parkway at the Kohl's store parking lot. The suspect reportedly abducted a 35-year-old victim, who he ordered at gunpoint to go to an ATM in the 17400 block of Spring Cypress. The victim withdrew cash and then was ordered to drive back to the original location, where the suspect exited the vehicle and fled on foot. 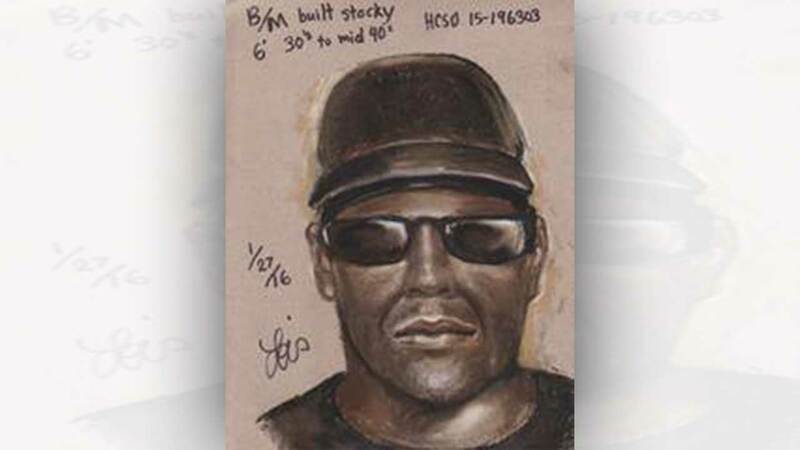 The suspect is described as a black male, standing around 6 feet tall with a stocky build. He's between 30 to 40 years old. He was wearing a black shirt, black pants and a black baseball cap and dark colored sunglasses. Anyone with information on this suspect is urged to call the Harris County Sheriff's Office Robbery Division at 713-274-9100 or Crime Stoppers at 713-222-TIPS (8374).